• Thirsty Thursdays at the Bowers presents “Modern Twist” on Thursday, Dec. 3, from 5 to 9 p.m. Enjoy a tour of “Modern Twist: Contemporary Japanese Bamboo Art,” indulge in a sake tasting, participate in an origami workshop, and experience musical performances by Taiko Center of Los Angeles and shakuhachi player David Zasloff. Happy hour drinks and appetizers presented by Tangata. General: $20. Bowers member: $15. Admission includes one free drink. Must be 18 and over. 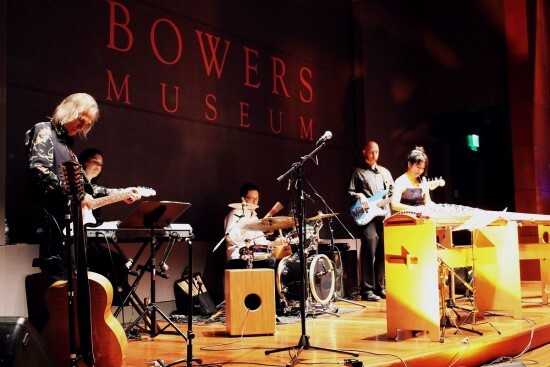 • “KOTO” featuring John York and Yukiko Matsuyama on Saturday, Dec. 5, from 2 to 3 p.m. York is a singer, composer, and guitarist best known as a former member of the Byrds, and most recently for his musical partnership with Barry McGuire. Matsuyama plays the koto and has recorded and played with Grammy Award-winning artists Paul Winter and Shakira. Tickets: $12 general or $7 with museum admission; $9 for Bowers members; $5 for students. • Winter Solstice Festival on Sunday, Dec. 6, from 10 a.m. to 4 p.m. A free family event including art-making activities, cultural traditions, and live music and dancing. Gary Wis-Ki-Ge-Amatyuk will perform a traditional Native American hoop dance and give a blessing for the new year. The Ploughboys, the house band of the legendary Tam O’Shanter Inn, will set your toes to tapping, and your hands clapping. Ceili Rua Dancers, passionate Irish folk dancers led by Erin Aileen Ealy and Caitriona Weafer. For more information on exhibits and programs at the museum, visit www.bowers.org.